I just came back from a few blissful days in New York City which always remind me of the time when I actually was a New Yorker. When I was living in New York (and was a student at the French Culinary Institute) I found myself a little overwhelmed by the city at times. The funny thing is that New York is actually a lot more brash and chaotic when you're visiting the city than when you live in it. I don't think I went to Times Square once when I lived in New York, and I got to appreciate the calm, often incredibly empty streets of the lower East side later in the evening and discover small neighborhoods you just don't have the time to go to when you're only in New York for a couple days. That being said though, what I thought I would love about New York was the one thing that pushed me away from it. New York is one of the only places in the world where you can find close to anything you want at almost anytime of the day - or night. That's especially true for food. I found myself missing the closed shops on Sundays in Paris and those times where the city really shuts up and you're forced to wait for things a little. New York was the beautiful, diverse city of the everything-available, and I realized that sometimes not having what you want when you want it is a precious thing in everyday life. That being said, I think I will always have a long-distance love affair with New York - and that I did, for a few days at least. Memorable moments were a dinner at Mario Batali's Otto, where Oliver and I indulged in multiple antipasti dishes including grilled octopus, eggplant caponata and pesto caprese as well as one of the best goat cheese and caramelized onion pizzas I've ever had. The restaurant also bottles its own carbonated water and sells it for a reasonable restaurant price which is always a nice touch in my book. It's one those nice casual dining settings where you can over-order but still come out with a decently-priced bill which is not always that easy to do in NY! I am now back in Montreal and wanted to welcome the new year with this recipe for Banana Bread. This is the Baked bakery recipe for banana chocolate muffins which I now make mostly use for banana loafs. I catch myself secretly coming up with devices for Oliver not to remember about the bananas we just bought at the market. The truth is, bananas take a while to be very, very ripe. In my experience, the best banana loafs - the really moist ones you can't stop eating - are made with incredibly mushy bananas. Even when the skin of bananas are completely brown, the banana inside is sometimes still not completely mushy. And, as much as I hate the word 'mushy' in the food-world, mushy is really the key to banana bread. The mushier the banana the more sweet it is, hence the better the loaf - you get the point! In another medium bowl, whisk together the flour, baking soda and salt. Make a well in the middle of the bowl and gently add in the banana mixture. Stir into just combined. Gently fold in the chocolate. Fill a greased loaf pan with the batter and bake for about 30-40 minutes or until a toothpick inserted in the center comes out just clean. Enjoy! I NEED to try this! It looks great! I feel the same way about New York but was never able to articulate it! When we visited we stayed in Times Square and I felt so agitated, which I didn't feel while living on the Upper West Side. Who was it that said the world is dying from too many choices? In Manhattan it is what you want, when you want it but the boroughs are saner and quieter if that is your desire. See, still choices! My choice: chocolate banana bread... what a great combo!!! I adore banana bread with chocolate, so I'm VERY happy to see this recipe! I'll have to hide the bananas so they get overripe. I totally agree with you about the bananas. My husband like to say that I get to them just before the bugs do??? Whatever as long as it's yummy! Ah, but you feel that longing and need to wait when you live here and can't AFFORD to go to any of the lovely places you know you really should try...I think I can squeeze a trip to Otto in my budget at some point, though. At least for Chef Kurtzman's awesome gelato...ok and a pizza. I've never been able to stand Times Square or any of the busy, sketchy touristy areas (I felt safer in Harlem than I do in that crazy shiny pickpocket-magnet)- thankfully when I first started visiting before my big move I had been staying with my best friend so she was able to show me the places that were important! Banana bread is one of my favorites! I would love a slice of this with a nice hot cup of coffee! This really does look most excellent. The combination of chocolate and banana is wonderful. ur pics are pic perfect....i know its u and nt the cam but can i wonder aloud what cam u shoot with? I hope this year I can accomplish the dream of going to NY - reading your post makes me want to go even more! What a delicious recipe - banana bread is already a favorite of mine, and chocolate can only make it better! How interesting, would never have thought of putting coffee in banana bread. Certainly agree about ripe bananas - in my experience they are never quite good enough for baking unless skins completely black. Chocolate and bananas...my two favorite things in one bread. Wowee. It looks superdelicious. I have only been to NY once sofar and I totally fell in love with the city but being there for 5 days I imagine was different then living there! You are SO RIGHT about mushy bananas -- any banana bread recipe that calls for 4 bananas and chocolate is for me! Bookmarking! I know what you mean. can you believe that I've never been to Madame tussauds considering I've lived in London for so many years! The berad looks really good! Otto is wonderful! I haven't been there in a long time (which is silly because i live here). Thank you for the reminder! Agreed, the more ripe the better! love the photo of thick slices. Very enticing! Mmmm.. Banana bread with chocolate in it is the BEST! Also love your description of NY. NYC is a place I never wanted to live, but I have to say it's not the city I expected when I moved here. Brunch at Saks: Thanks and I hope you get to try the bread! Beautiful chocolate banana bread and gorgeous photo. Love the description of NY. Sometimes the infinite array of choices in NYC can induce a kind of overload paralysis - since you can't possibly keep tabs on everything going on, you just default to what you know. wow! what a moist looking banana bread. Have tried the regular ones but never made it with chocolate. Great clik!. I'm a former New Yorker too. What drove me from the city was very similar to what you described. In a city that was always on, I just wanted a little off time -- time when it didn't feel like everything was always going around me. I wanted quiet (not quiet as in noise, quiet as in peacefulness and calm) ... but these days and for at least the last five years, I have had the most intense yearning to just go back and be at home. 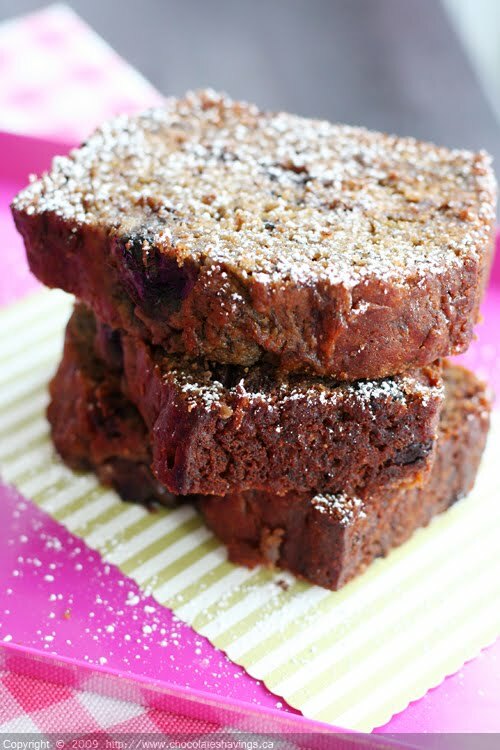 Stephanie Savors the Moment: Let me know if you give the banana bread a try! Montreal is a wonderfully quaint, let me know if you ever visit - I'll send you a list of the my favorite eats in the city! Oh I get the point....it rings loud and clear. This moist banana cake sounds and looks great. Lovely photo! Whats not to love: bananas, butter, brown sugar, chocolate and then the surprise ingredient, espresso. Yes, it would be very hard to stop eating this! NY, I lived there too, not anymore. Here in the OC we don't get too many of those quaint, special, tucked away open at odd hours restaurants. I love NYC. I've only been once, but it was amazing and I've been dying to get back. Sigh. The recipe looks great, by the way. I love banana bread. I love chocolate. It only seems natural to combine them. Why haven't I tried this before??? i keep meaning to write about my chocolate banana bread disaster from last year... the Baked recipe looks a lot better than mine. My mother, who religiously follows this blog, tried this recipe. It was amazing. Best banana bread I have ever had. sheetal paliwal: I'm glad you enjoyed it! It's one of my favorite chocolate banana bread recipes!